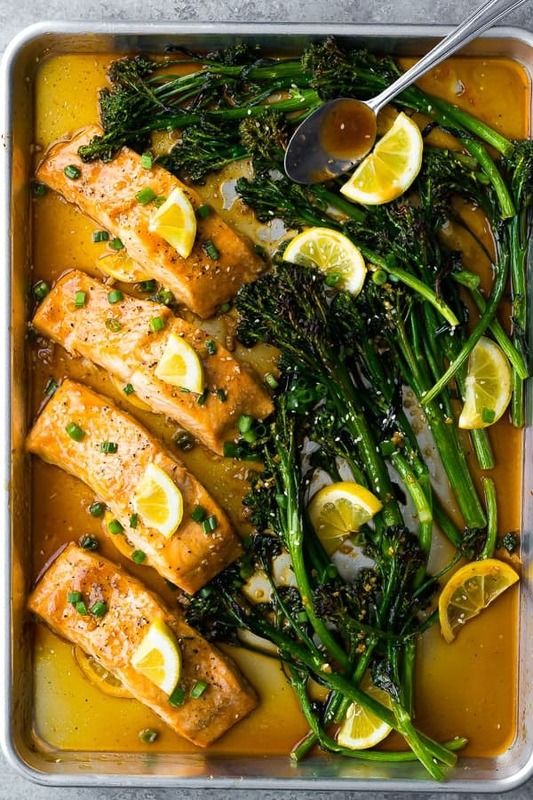 A simple honey lemon salmon recipe baked up on a sheet pan with broccolini. Serve over rice and drizzle with the honey lemon sauce. Makes a great meal prep lunch. We eat salmon once a week at our house, and it’s about darn time that I shared another recipe…it was the summer when I shared this Lemon Pepper Sheet Pan Salmon! I’m back with another lemony salmon recipe, but this time, there’s sauce involved…a sweet and savory honey lemon sauce with garlic, a bit of sesame oil, and some soy sauce. And the best part is the sauce thickens right up on the pan, so you don’t have to make any extra dishes to thicken the sauce. Hurray for that! 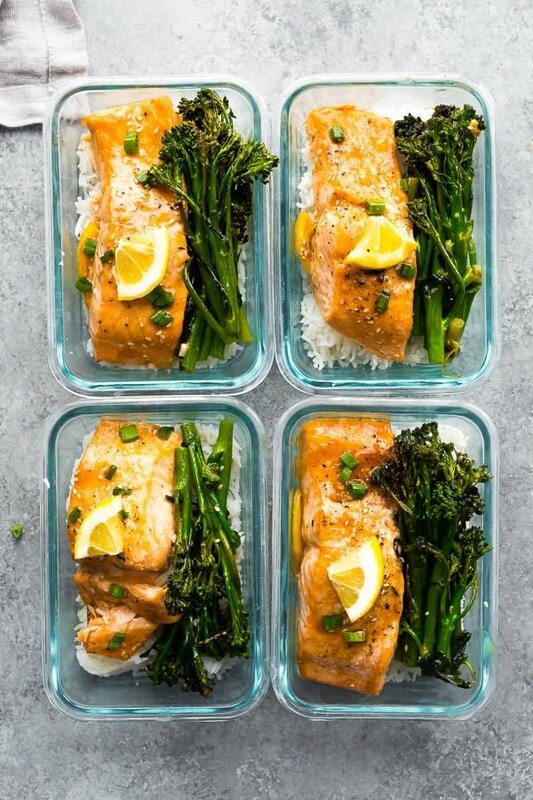 Today’s honey lemon salmon recipe pairs perfectly with Mann’s Broccolini. 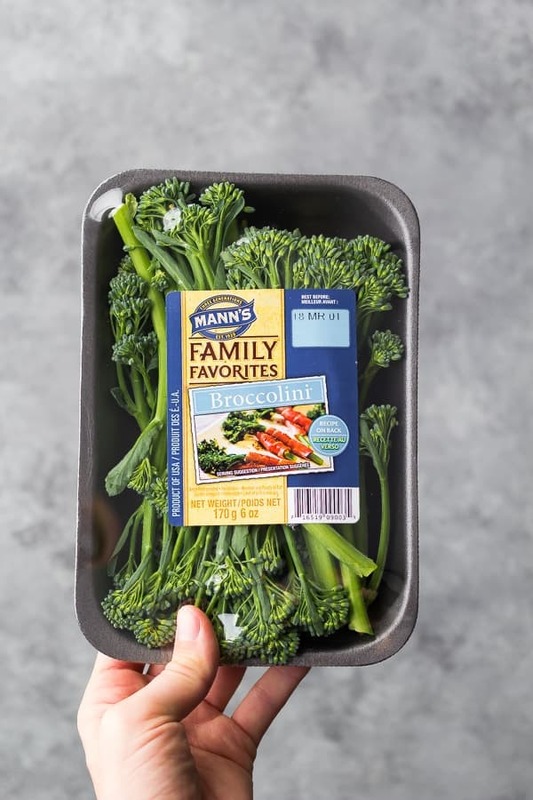 Mann’s introduced Broccolini to North America 20 years ago (Happy Birthday Broccolini!) with the help of the Sakata Seed Company. What is broccolini? It’s slightly sweeter and more tender than broccoli, and went amazingly well with the honey and lemon flavors in this recipe! 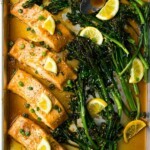 drizzle the salmon and broccolini with the honey lemon sauce, then return to the oven to broil. Don’t forget to rotate the pan half way through the broiling, so it doesn’t burn on one side! We enjoyed our honey lemon salmon and broccolini served over rice, spooning allllll the sauce from the pan over top. It also made a great meal prep lunch! A great way to mix up my chicken and vegetarian meal prep lunch routine. *This post was sponsored by Mann’s and I was compensated monetarily for my time. I was inspired to create this recipe after seeing Kelly from Life Made Sweeter’s Cashew Chicken Sheet Pan! Doesn’t it look AMAZING!? 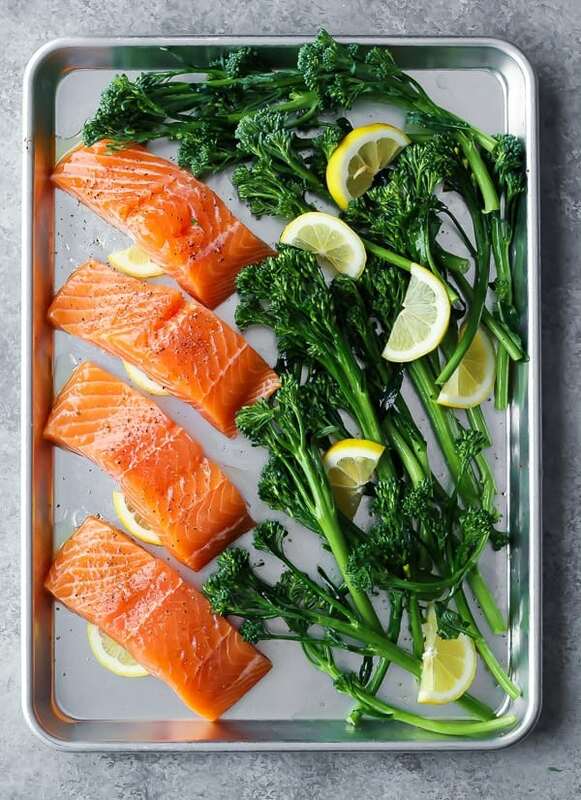 Arrange salmon and broccolini on a sheet pan. 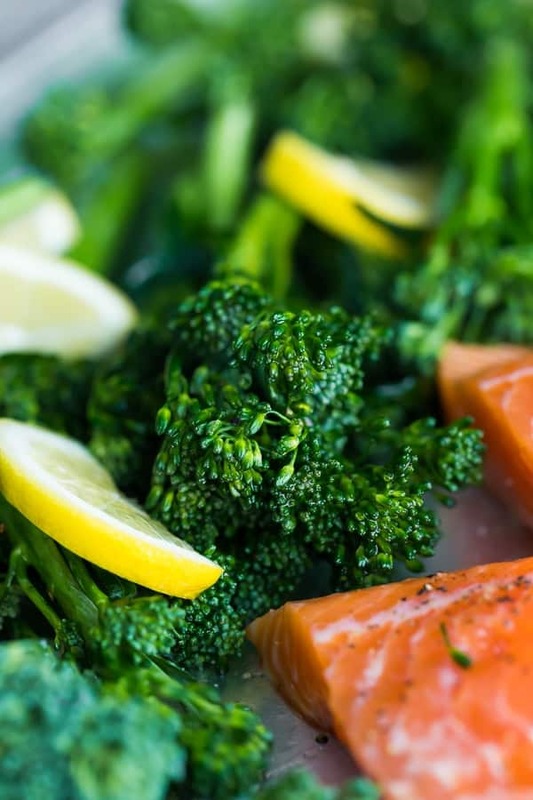 Brush the salmon with olive oil, and toss the broccolini to coat. Season with salt and pepper. While salmon is baking, shake up the sauce ingredients until no clumps remain. 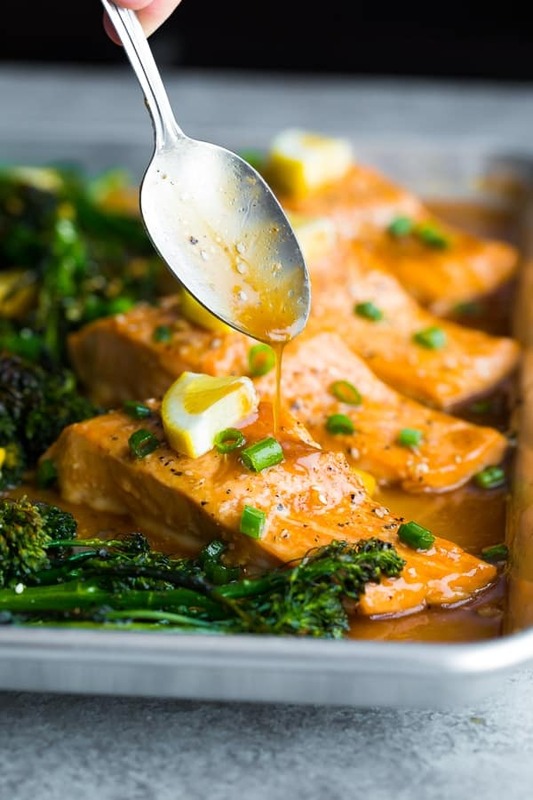 Drizzle the salmon and broccolini with the sauce, return to the oven and set to broil. Broil for 2-5 minutes...rotate half way. Keep an eye on it as all broilers are different and you don't want to burn it! When sauce has thickened, remove from oven and drizzle over salmon and broccolini. Serve over rice with sesame seeds and green onion. Make sure to wash the sheet pan quickly after eating; it becomes difficult to clean after it sits for awhile. Nutritional information excludes garnishes and rice. This recipe was a home run in my house! We have it once a week now ? This is a new household family favorite – thank you! hi, how long can this be kept once it’s cooked and stored in containers? Hi Joyce! This is good for up to 4 days in the fridge. Hope you enjoy it!